As a business owner, you have heard the old adage “cash is king.” If you are a seasoned business owner, you’ve probably lived through some lean years. A great way to weather the occasionally stormy waters of business ownership is to monitor and to manage your cash flow. If you want to grow your business, a strong cash position can help you fund the growth or obtain debt financing when you need it. Lenders will ask to see your cash flow history. 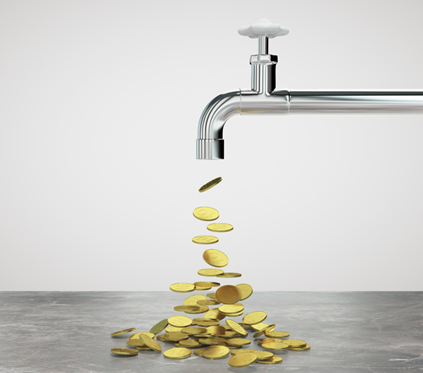 We list below six strategies for managing your cash flow. We are providing general tips. Each business is unique. If you have questions about how you can improve the cash flow for your particular business, please contact us. You know you can’t manage what you don’t measure. This is very true with cash. You must have a system in place to project your cash-in and cash-out on a monthly basis. If you use a standard accounting package, such as QuickBooks, the accounting software typically includes a cash flow projection report. If you want the ability to project “what if” scenarios, you can develop a cash flow projection using a simple spreadsheet. With a spreadsheet, you can see what happens to your cash flow if a client pays you late. Here is a template for a cash flow spreadsheet. You have basic overhead costs each month such as base salaries, rent, utilities, insurance, etc. These base costs are your bare-bones bottom line. This base is the minimum you need in cash each month. You can create a category for these base expenses then add additional categories for the more flexible expenses, conference attendance, training, travel, etc. If you provide a service, which requires a lot of effort before the job is complete, you can ask for payments in stages. This approach works well for companies providing services in construction, marketing, web design, PR, engineering, etc. You could require customers to provide 30% at contract signing, 30% at 2 subsequent milestones and the final 10% at job completion. You could offer terms of 2/10 net 30, which provides a 2% discount when customers pay in 10 days. The full amount is due in 30 days. If you give this option to customers, they get an equivalent of a 73% APR. You could ask for all payment up front unless you have a prior relationship with the customer. As a softer approach, you could also extend credit only to new customers that pass a credit check. Customers won’t pay you if you don’t send an invoice. Don’t wait 60 days to invoice for the work you complete. Make it a policy to send the invoice as soon as your work is done. Make sure you follow-up on any past-due invoices. Items do get lost. Emails with invoice attachments can go to a SPAM folder and USPS-delivered mail can get misplaced. If you bring a lot of work to a sub-contractor, they may be willing to take this approach. One way to implement these terms is to discuss the strategy upfront, prior to starting the teaming project. If you pay your subcontractors swiftly, when you can, they are very likely to work with you on a slow-paying client. If you purchase from a regular supplier, see if the supplier will allow you to take payment-over-time. Many vendors will provide timed-payments to favored customers. If you can, set up electronic funds transfer payments to your largest vendors. You can then pay on the day the bill is due and avoid the time in the mail a check needs to reach vendors. The best time to apply for a line of credit is when you don’t need it. Apply when you have strong cash flow this year and anticipate confronting a cash crunch in the future. If you are a very small business, many banks will require collateral for a line of credit. If you know your business will be growing, make sure you have enough cash on-hand or a plan to fund the growth. Many businesses on the cusp of success fail due to insufficient cash to finance the growth. If you see more sales on the horizon, think about the cash that you need to fund that growth. You may need to purchase new equipment, rent more space, and hire more staff before you capture income from the growth. Business.com has an interesting article on creative ways to fund growth.